Thank you so much for all the support and comments left behind after reading my first post about Munich, it really inspires me to write and share more of my travelling experiences. I hope that these can be of beneficial to you and may even encourage you on taking that leap to visit the places yourself and trying them personally. The second place that I visited after my trip at Munich was Vienna, the capital of Austria that shares its borders with Germany. Vienna contains a long history of culture and arts having produced the musical genius in its past Mozart, by walking around the city you can see the influence of music and arts that has helped to form and shape the city to what it is now today. You can see many different statues and buildings of majestic appearances that also describe its history such as the St Stephens Cathedral located in the city centre. The sheer size of the cathedral made me awestruck as well as the delicate gothic and roman designs on the outer building. Venturing around the city of Vienna, one of the things that you are never short of seeing are the amount of Cafés located on the streets, in Vienna they are referred to as ‘Coffee houses’. These coffee houses are an important part to the culture of Viennese life containing an exquisite history to its making; the locals may have a quick visit in the morning reading the newspaper accompanied with a cup of coffee or may even spend many hours reading and enjoying the friendly atmosphere. The first coffee house that I encountered was called ‘Aida’; this place contains an exterior décor of bright pink and is quite famous having many branches throughout Vienna as a chain. The interior design was very minimal with plastic chairs and tables, a normal counter with all the sweet delicacies on show especially the cakes and pastries. I ordered a classic Americano and chocolate cake; my Americano was served with a glass of water on a tray that showcased the first signs of uniqueness that Vienna had to offer. I must say that this coffee house was very similar to the modern cafes such as Starbucks and Costa however with its original traditional décor. 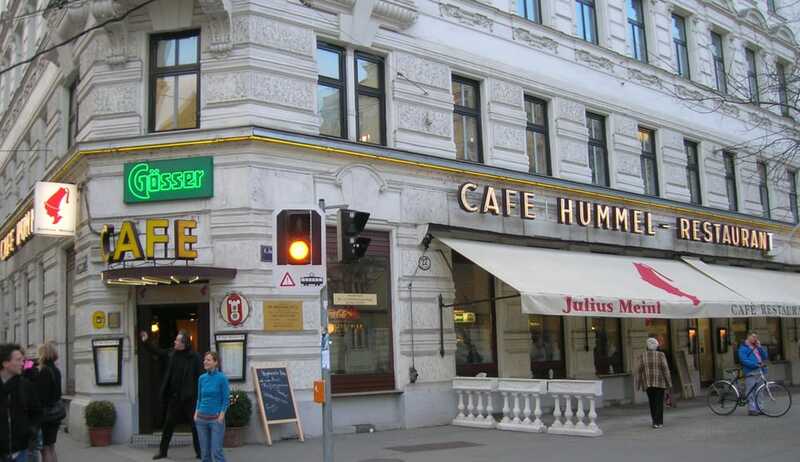 My true coffee house experience occurred when I was wandering down the streets of Vienna and we went into a local coffee house tucked in behind one of the side streets. This place didn’t have much of an outstanding exterior, as the building was painted black with an only few tables on the outside. I knew this was the place though as every table was filled with locals accompanied with a cup of coffee either reading or having small conversations between them. When I entered inside, the place was dimly lit with a rustic and smoky feel; this included the old wooden furniture plus bookcases and trays filled with various reading materials. I had a look at the menu and realized that this place mainly had coffee to offer for the customers, the place did not have any counters or stands at all for any food this also showcased what truly a ‘Coffee house’ was supposed to be. I had a cappuccino this time sitting near one of the windows; the rich and deep flavour of coffee enriched my time at the coffee house. It was also peaceful and tranquil as other customers were absorbed into reading or chatting quietly while I was just there enjoying my cup of coffee. But when she took me to a local restaurant in Vienna; boy was I wrong in thinking that the Viennese schnitzel was nothing special. 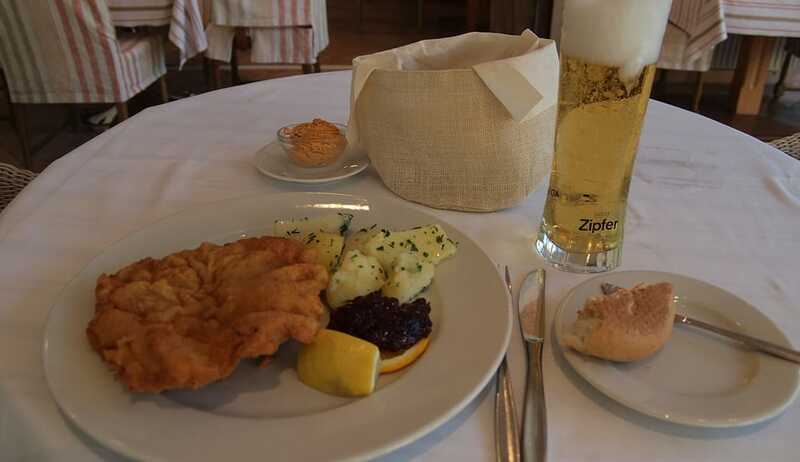 The Wiener schnitzel is a very thinly tenderized veal escalope that is bread coated with a layer of butter and egg; it is a very traditional dish originating from Vienna. The local restaurant that I visited was full of customers with a lively atmosphere; the staffs were very friendly and knowledgeable about the food. When I ordered the schnitzel I expected the size to be the same around an 8oz steak however what appeared before was a schnitzel the size of a 10-inch pizza encompassing the whole plate! It was served with a potato salad on the side and a slice of lemon to squeeze on top of the schnitzel to combine a citrus taste to the breaded outer coating. The schnitzel was fried to perfection as the moisture of the veal remained inside however still preserving the crunch of the coating; it was also very well-seasoned with a hint of pepper, this provided the little kick that made you always going for another bite. The colour and shape of the schnitzel was very appealing as it was fried until golden brown, the waiter described to us that, when the schnitzel was in the pan, the juices of the veal and herbs is scooped and poured over the top various times to deepen the flavour of the veal evenly. When visiting Vienna you have to visit a place called Naschmarkt, it is one of the most popular and diverse food markets in the city and contains a constant flow of locals and tourists food shopping. It compromises several long streets with stalls on either side showcasing all different kinds of foods; many of them have little tasters allowing you to try out the products that they sell. There are numerous varieties of fruits and veg as well as the different types of local produces that would leave you salivating each time look at them. By walking along the streets you are also bombarded by the aromatic smells of the sweet tasting fruits of some that you have never seen before. I have always been a fan of sweet delicacies and as they say, I do indeed have a sweet tooth. There were a lot of different pastry shops on the streets even excluding the coffee houses as they also had them on display. Vienna is famous for its ‘Apfelstrudel’ and is one of the most popular dishes in the coffee houses as it best complemented with a cup of coffee. The Apfelstrudel is essentially a strudel pastry with cooked apple filling in the middle; it is usually in the shape and size of a long oblong and then sliced to smaller pieces to be served. The taste of sweet and bitter of the coffee balances each other perfectly; the strudel can also be accompanied with ice cream, cream or vanilla sauce. I have tried all three and I would recommend the vanilla sauce as it provided the apple strudel the extra moisture and texture that it needed. The apple filling is very similar to that of apple pie but the pastry was entirely different as it is much thinner, I nearly had this every time I stopped by at a coffee house as it was a perfect small snack to nibble on during your breaks. Another sweet delicacy that I found very popular at the coffee houses were called ‘Sachertorte’, this was a double layered chocolate cake with an apricot jam filling. The appearance of the chocolate cake was absolutely wonderful; it was covered with a dense and compact chocolate layer of icing that looks very smooth. The flavour is as you would expect, the dark and rich flavours of the chocolate are empowered by the icing. The soft sponge and the sweet apricot jam control the slight bitterness of the chocolate, I was always given quite a generous slice. It seemed to me that coffee and sweets were deeply integrated to a part of Viennese living and during my stay there I had encountered a hint of it. It ended up being a daily routine for me as I always went for a visit at a coffee house at least once a day in the morning or afternoon. The food specialties of each country can be a symbol that defines them in their own right such as the UK having fish and chips, the Sunday roast and definitely a good cup of tea. The foods that defined Vienna for me personally were the Wiener schnitzel, the sweet pastries including the different type of desserts and also the entire experience of having a cup of coffee in one the many historic coffee houses. I also had different types of activities in Vienna such as wine tasting on the scenic mountains, the bike rides around the outskirts of Vienna gazing on the fantastic views of the living lives of the countryside locals. However as I said previously, I have only written a part of my experiences so that it would leave some for your imagination and also for you to discover yourself.